Posted December 11, 2013 · Where to get 6 mm plywood to make replacement for defective left panel? I ordered an Ultimaker off of Maker Shed and during assembly discovered that the left panel is wrong (see pictures). It would in no way fit on the left side of the machine and when I matched up its feet with that of the right side, I found that the ball bearing didn't line up. You can also see that the rectangular slots for the tabs don't line up either. I e-mailed both Ultimaker and MakerShed on Monday and haven't yet heard back from either. I have access to a laser cutter, so it seems like the only other option is to laser cut a replacement panel. What I need to know is a good place to get the birch plywood in the U.S. and whether it has to be 6mm, or if 1/4" will suffice. Thanks for your advice, this has been an extremely aggravating experience and I would really like to move on from it. Here are just a couple to show what I am talking about. Be aware that they have already gone home for the day as it is noon here in Boston but 6pm in The Netherlands. They will likely send you a free one promptly as of course they are in stock and it will probably take about 3 or 4 days once they ship it. While you are waiting for it consider assembling the Z stage and/or the print head as those can be done "out of order" and take a while. Also the ulticontroller (although that doesn't take long at all!). The Z stage took a very long time for me compared to everything else. I had to do a hours of filing. If you're in the states (which I'm guessing you are since it was a MakerSHED purchase), I've had luck with Woodcraft. They have 6mm birch plywood in stock in different sizes; a 30" x 48" will run you around $21 plus S&H. It may actually be 0.25" instead of 6mm, but its only about 3 sheets of paper thicker, so it shouldn't matter. I did put in a support ticket. I put it in Sunday night. Heard back from Ultimaker now. They said they are looking into it and hope to have a solution soon. I hope they find the problem, To me it looks like someone used the wrong file to cut the parts, or something like that. I hope this did not happen to very many panels. Posted December 12, 2013 · Where to get 6 mm plywood to make replacement for defective left panel? I'm guessing the panel slipped at some point while it was being cut. I know one other person who got a bad panel where it doesn't align but I think this only happens to maybe 1%. In other words, it would have been a strange slip that managed to produce this result. Do you have any problems with knots? The Woodcraft stuff is not the fancy aircraft grade plywood that the machine is made from. I am a little worried that it might not work so well in the laser cutter. Aircraft Spruce. Cheap, fast shipment in the US, whatever thickness and quality level you want. To be honest I was using the Woodcraft birch on a different project, so I wasn't really paying attention to knots. I don't think there was any issue with knots, but flatness may be off from an aircraft version. I would go with Nick's suggestion; I haven't used them personally but have heard good things about them, excluding a higher cost. Finally got a decision from Ultimaker, they recommended replacing the laser pack entirely. They will be shipping one to me soon. I am not looking forward to going through the finishing process again, or waiting for the shipment, but at least least I will have the right parts. Need to think of something to do with the old parts now. Some of them I will likely keep for spares. I think I will have to cut the frame up to get the bearing out. They were a real tight squeeze to get in there. That pretty much means it won't be useful for building another ultimaker, even if I get all the other parts together. The wood is really nice, but I am afraid the finish might release some bad stuff if I laser cut it. 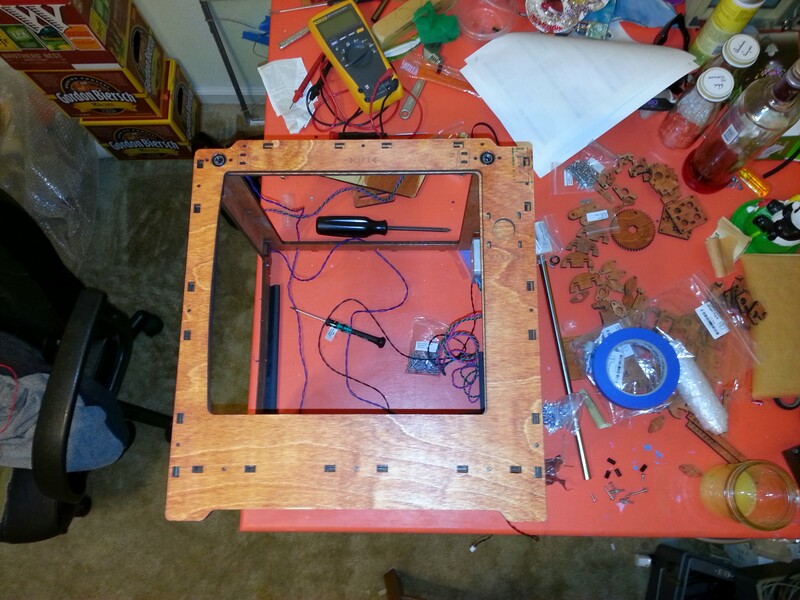 Posted December 13, 2013 · Where to get 6 mm plywood to make replacement for defective left panel? Probably don't have to be worried about the finish when lasercutting, unless you sought out some lead paint, just for style points. Bet the glue in the plywood is worse, and that gets cut all the time. I said it already - but consider assembling the Z stage now with the parts you have. 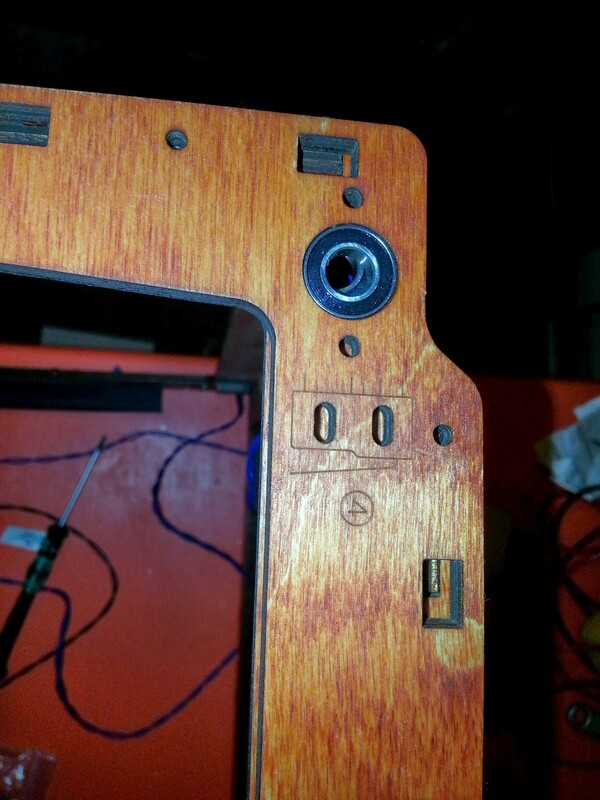 Posted December 14, 2013 · Where to get 6 mm plywood to make replacement for defective left panel? I might do that, just so I will have experience having done it. Their support team might get there in the end, but they aren't exactly lightning fast. Asked for and received my shipping address on the 12th at around noon (their time). Haven't heard back from them yet about shipping information. Wish I had a better idea about how long this was going to take. My reason for not pushing forward with assembly has been that I don't want to refinish everything to match. Staining and lacquering took a lot of time and effort. I just about had a mental brake down when I discovered the panel didn't fit. Funny thing is that I looked around for information on checking all the QCing the parts upon delivery, and didn't find anything. Wish I had taken the time to find the cut files and figured it out for myself. Then I could have spent last weekend doing something besides breathing fumes. Started on the Z platform and found that the 30mm screws are bottoming out in the t-slots in step 4. Just thought of a simple solution to the issue with the t-slots. Adding hex nuts to the six screws before inserting them will resolve the problem. Posted December 18, 2013 · Where to get 6 mm plywood to make replacement for defective left panel? I am starting to go from patient to really irritated about how long Ultimaker is taking to ship. It seems to take 48 hours for them to give a reply to anything, even if I reply back before the open of business in the Netherlands. 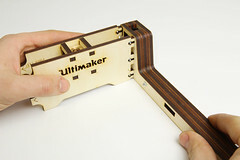 Dec 12th 12:40 pm: Ultimaker responds that they recognize the problem, recommend resolution and ask for shipping address. So it has now been a week. They have recognized that there is a problem. I have been relatively quick to respond to their requests for information, and they seem to be treating the problem with all the urgency of a sundial. Maybe there is something I don't get about Netherlands culture, but it doesn't seem like it should take this long. Posted December 24, 2013 · Where to get 6 mm plywood to make replacement for defective left panel? New parts are finally shipping. Hurra! Any idea on how long DHL "EXPRESS WORLDWIDE" service takes to get from Netherlands to the U.S.? Posted December 25, 2013 · Where to get 6 mm plywood to make replacement for defective left panel? Typically 3 days. They are quite fast and seem to work on Sundays (not sure about dec 25 though). Finally got a chance to test the new panel today and just about cried when it didn't fit. They said they were sending a whole new laser pack, but it was just the one panel. I don't even no what to say to the Ultimaker people anymore. I am so upset. So sorry to hear that you're having problems still. I'll poke the support folks about it on your behalf. Is the new panel the same as the one you had before? If so, then I suspect that the problem isn't that panel, but one of the others - or that there's something about the other parts of the assembly that is causing problems. How do the old and new panels compare? Have you compared the panels to the drawings? The above link has drawings of all the panels. Maybe you should have figured out which measurement was off (if any) before requesting a specific panel. Sorry about your frustration. Click on the above link, select the panel you care about, then you can select the pdf drawing and hit "raw" to just get the file. Or you can download the STEP file if you have autodesk, solidworks or a few other cad systems that read it. Personally I would probably just get a screen shot of the pdf, load it into photoshop and setup the mm/pixel in photoshop to match the drawing. Then make measurements directly with photoshop. Or I would photograph all my suspect panels and compare them visually on the computer screen on top of each other with the pdf images. You took a great photograph of the problem in your original post in this thread. But I can't really see the right panel underneath. Could you take a photograph of that also? That combined with the photograph of the left panel on top that you already took - and combined with the pdfs - maybe that can narrow down a specific dimension so that you can say "only ship me the left panel if the distance from the bearing hole to the edge is X mm". Something like that. UM is probably going to think you simply put the right panel on inside out. Or something like that. So if you show a photo of the right panel installed properly it is more convincing. The new left panel is different. It is closer to fitting. Also, I just checked the alignment of the bearings relative to the right panel and they still do not line up. I am suspicious that more than just the left panel was cut incorrectly. In the photo, the left panel is installed on the correct side.